Located in Bourg-Saint-Andéol, Logis Hotel le Prieuré is just 20 km from Montélimar. It features a Louis XIII style lounge and a bar in the reception with free Wi-Fi access. The soundproof rooms at Hotel Le Prieuré offer an LCD TV and a safe. Each has a private bathroom with amenities and some rooms feature an original fireplace. The restaurant features a stone arched ceiling and serves a buffet breakfast every day. Guests can choose to order room service or dine on the hotel's terrace on sunny mornings. Le Prieuré is 12 minutes from the A7 providing direct access to Orange and Valence. The Ardèche Gorges are a 20 km drive away and public parking is free on site. This room comes with a flat-screen TV and an en suite bathroom with free toiletries and bathtub. This room comes with flat-screen TV and an en suite bathroom with bathtub or shower and free toiletries. 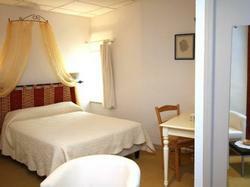 This room features a flat-screen TV and an en suite bathroom with free toiletries and bathtub. The Superior Double Room is more spacious. This room comes with a flat-screen TV and an en suite bathroom with free toiletries and bathtub or shower.